And as the Canadian winter rolls on, my British saloon continues to chill. 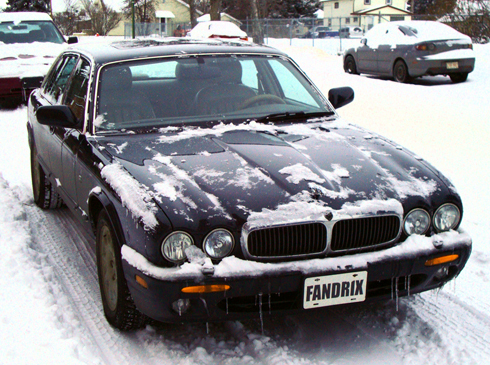 For the most part my Jaguar XJ8 has performed beautifully and been driven in all winter conditions, despite numerous wide-eyed reactions for my decision to do so. However, the car hasn't gone without its share of maintenance to keep things ship-shape. New premium tires, the battery, radiator hoses, the water pump and the thermostat were all replaced over the last several months to keep things running smoothly and in premium condition. As my first year of Jaguar ownership continues I often feel like there aren't enough excuses to talk about it, emphasize my euphoria, or share the quirks of the experience (like trying to charge a dead battery that's in a trunk that requires electricity to open). But then what are blogs for? While a Jag is certainly not the most agile or ideal winter vehicle, it's still been a blast to drive. No doubt, I'm still anxious to get back to cruising on clear streets and having my car stay clean for more than an afternoon. I shot an experimental test video with my Flip HD cam while driving my Jaguar around town just a couple weeks ago. Check it out HERE and don't be surprised when my car makes a few more cameos after the ice thaws.